Herb Cheese - Cheese Dairy Lagunda whole loaf approx. 2,5 kg. Description: typical smell after fresh herbs, strengthened with garlic and chives. 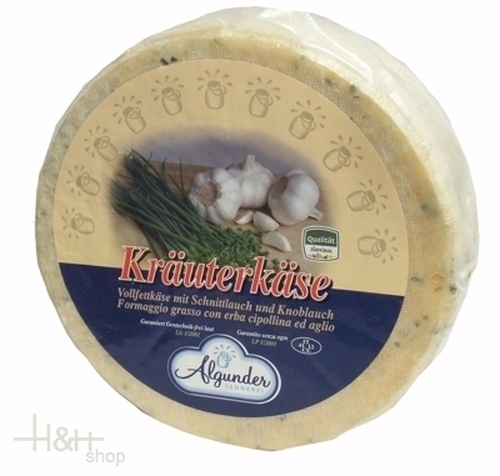 The Algunder herb cheese has a pleasantly sourish mark and is slightly piquant in the taste. Fat salary: 50% F.i. T.
ready for shipment: in ca. 5 days South Tyrolean apple vinegar Weissenhof 0.5 lt.
Buy now this product together with Mountain Clove Cheese Gamsegghof approx. 800 gr. ready for shipment: in ca. 5 days Mountain Clove Cheese Gamsegghof approx. 800 gr. Melus Camembert DEGUST approx. 250 gr. 12,70 EUR / 5,08 €/100 gr. Melus Mignon Camembert DEGUST approx. 150 gr. 10,45 EUR / 6,97 €/100 gr.